Rashbam (רשב"ם) is a Hebrew acronym for Rabbi Shmuel ben Meir (c. 1085 - c. 1158). He was the grandson and student of the great Jewish biblical commentator Rashi. Like his grandfather, he was a biblical commentator and Talmudist of the first rank. Born near Troyes, France, his mother was Yocheved, the daughter of Rashi, and his father was Meir ben Shmuel. Rashbam's commentary on the Torah is characterized by an emphasis on the plain meaning (peshat) of the text. This emphasis occasionally caused controversy, as he did not seek to interpret difficult passages, but often accepted them at face value. While his commentaries on the Bible are noted for their brevity and clarity, his notes on the Talmud are known for their length and difficulty to follow. In his personal character, Rashbam was noted for his piety and humility. He was conversant with Christian theology and is thought to have defended Jewish beliefs in public disputes arranged by Christian leaders to prove the inferiority of Judaism. 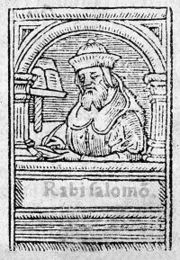 Rashbam was the older brother of two other well-known Talmudic scholars: Rivam and the Rabbeinu Tam, the latter of whom was his pupil, whose own commentaries would appear prominently in future editions of the Talmud. Born around 1085, at Ramerupt, near Troyes, Shmuel (or Samuel) ben Meir hailed from a famous lineage, being the grandson of Rashi, considered by many as the greatest Jewish biblical commentator of all time. Shmuel was Rashi's direct pupil and initially followed his tradition of interpretation, although they later argued, with Shmuel favoring a more literal attitude and Rashi tending toward broader interpretations of the text. He is said to have been so modest that he always walked with downcast eyes. He was known especially for his piety. He reportedly earned his living by raising livestock, especially sheep, and growing grapes. He was also famous for being absent-minded, so much so that once, while traveling, he climbed into a wagon loaded with cattle without realizing what he was doing. Rashbam's knowledge of the Christian interpretation of the Hebrew Bible leads scholars to believe that he participated in the public debates of his era, organized by Christians to discredit the Jewish view of its own scriptures. One of the earliest writings of the Rashbam was his commentary on the Song of Songs, which he regards as a representation of a dialogue between God (the lover) and the Jewish people (his beloved), and as a description of the condition of Israel in times of both misery and of happiness. However, in his other biblical commentaries Rashbam generally opposes allegorical interpretation of the scriptures and takes a more realistic approach. He used the Masoretic text of the Bible primarily, but compared it with French, German, Spanish, and Aramaic translations. He also used the Latin Vulgate, primarily in order to point out passages in which he objected to its rendering. Jewish sources which he used included the Mishnah and various halakhic (legal) and midrashic (non-legal) texts. Those who love pure reason should always remember that the sages have said a biblical passage must not be deprived of its original meaning. Yet as a consequence of the opinion expressed by them that the constant study of the Talmud is one of the most laudable pursuits, commentators have been unable… to expound individual verses according to their obvious meaning. Even my grandfather Solomon (Rashi) was an adherent of this school; and I had an argument with him on that account, in which he admitted that he would revise his commentaries if he had time to do so. Despite his penchant for realism, Rashbam was by no means unsophisticated in his method. He attempted to harmonize his comments with the progress made by the learned rabbinical exegesis of his time, and yet to explain in the clearest possible terms the inner meaning of the scriptural text when it was not obvious. He sought to preserve the traditional Talmudic interpretation when it agreed with the literal sense and to show the connection of seemingly disconnected passages of the Bible. Throughout his commentaries he shows a strong concern to defend Judaism, especially from its Christian critics. "They [Simeon and Levi] came upon the city [Shechem]." This certainly means that they came upon the city when it felt itself secure, since the Hebrew word "beṭaḥ" can be applied only to an object at rest. This explanation may at the same time intentionally differ with that of Rashi, who sees "beṭaḥ" as referring to the pain of the city's inhabitants—who were recovering from circumcision—which Rashi believes instilled Simeon and Levi with confidence to attack. Comparing Rashi and Rashbam in other passages shows that Rashbam often simply repeats what is said in the text in other words, while Rashi is more prone to interpret it with reference to Talmudic and aggadic sources. The most radical of Rashbam's commentaries is that on Ecclesiastes (Hebrew: Qoheleth). Here he departs from his usual methodology in order to save the text from its nihilistic implications. For instance, he declares that the words "vanity of vanities" were not spoken by the preacher, but were prefixed by the editor who arranged the book in its present form. Where "vanity" is used elsewhere and often in the text, Rashbam tends to reject the traditional understanding of the term as "empty and void" and interprets its as meaning "that which is hidden from men." However, in opposition to earlier commentators, he explains the sentences of the "preacher" (qoheleth) relating to doubts and pessimism according to their literal meaning (Eccl. 3:21, 5:7). Wisdom, he says, is given by God to men to help them truly understand what even the preacher may not. He also draws a distinction between practical wisdom, which is not speculative, and theoretical wisdom. In regard to theology, Rashbam holds to the doctrine of the absolute spirituality and omniscience of God, believing that neither of these is in any way circumscribed. In his views on angels, prophecy, and the miracles mentioned in the Bible, he takes a straightforward and literalist view, believing simply what the Bible says of these things. He interprets Gen. 1:26-27 ("Let 'us' create man in our image…") as God speaking to the angels, in whose image man was created, with woman being part of man. His geographical notes show that Rashbam had accurate knowledge of the geography of Palestine. In his knowledge of Hebrew grammar and lexicography not only was he the equal of his contemporaries, but surpassed them. His one deficiency in this regard is that he could not make use of works of Saadia Gaon, as he did not know Arabic. On Abodah Zarah, partly quoted in "Temim De'im," ed. Venice, iii. 19b, 20b, 28c. Rashbam is, however, considered much weaker than Rashi in his Talmudic commentaries. He occasionally becomes excessively verbose in attempting detailed explanations, while the simplicity of Rashi is at once evident—a paradoxical reversal of their roles in biblical commentary, where it is Rashbam who is the more succinct of the two. Although Rashbam is an important commentator in his own right, his greatest legacy was in acting as a bridge between his brother and pupil, Rabbeinu Tam, and their grandfather Rashi. The running commentaries of both Rashi and Rabeinu Tam would later appear in virtually every edition of the Talmud through the present day. Parts of Rashbam's own commentary on the Talmud have also been preserved, and they appear on the pages of most editions of the tractate Bava Batra, where no commentary by Rashi is available, as well as in the last chapter of tractate Pesachim. Rashbam's clear approach to biblical exegesis in some ways anticipated that of modern scholarship, which often accepts difficult passages as meaning what they say rather than trying to interpret them. According to one legend, Rashbam so thoroughly convinced his grandfather of this approach that Rashi burned his own works. While Rashbam himself boasts that Rashi admit he errors, it is more likely that Rashbam, being a pious grandson, helped to preserve Rashi's works and pass them on through his brother, Rabeinu Tam. Rashbam's acronym may also be spelled RaSHBaM. His given name may be given as either Samuel or Shmuel. Many of the extant commentaries of Rashbam have been recently transcribed, analyzed, and published English. ↑ Jewish Encylopedia, Samuel B. Meïr (RaSHBaM). Retrieved November 22, 2008.
ben Meir, Samuel (author) and Martin I. Lockshin (ed.). Rashbam's Commentary on Deuteronomy: An Annotated Translation. Brown Judaic studies, no. 340. Providence, RI: Brown Judaic Studies, 2004. ISBN 9781930675193. Harris, Robert A. Discerning Parallelism: A Study in Northern French Medieval Jewish Biblical Exegesis. Brown Judaic studies, no. 341. Providence, R.I.: Brown Judaic Studies, 2004. ISBN 9781930675223. Lockshin, Martin I. Rabbi Samuel Ben Meir's Commentary on Genesis: An Annotated Translation. Lewiston, NY, USA: E. Mellen Press, 1989. ISBN 9780889462564. Rashbam, Sara Japhet, and Robert B. Salters. The Commentary of R. Samuel Ben Meir Rashbam on Qoheleth. Jerusalem: The Magnes Press, The Hebrew University, 1985. ISBN 9789652235176. This page was last modified on 25 June 2015, at 15:21.